FSU holds a combined 29-1 record over the four teams it will see over the weekend, with its only loss coming to Georgia State in 2015. FSU holds a 10-0 record over South Carolina, which stands as its best record against any team. The Seminoles will open the weekend facing a pair of CCSA opponents with No. 16 FAU and No. 8 South Carolina on Friday (Feb. 23), and wrap up the weekend with No. 12 Georgia State and No. 15 Stetson on Saturday (Feb. 24). This is the first of seven tournaments that the Seminoles will compete in, and four of the 22 different opponents FSU will see this year. After this weekend, the team returns home to host the Hampton Inn Capitol-University Invitational on March 2 and 3. Florida State holds a 6-0 all-time record over the Owls. FAU enters its fourth season under head coach Capri Grotowski in 2018. Grotowski led the Owls to a program-high 21 wins last season, including an 18-match win streak. The team advanced to the semifinals of the 2017 CCSA Tournament before being knocked out by the Seminoles in FSU’s path to the championship title. Grotowski added six freshmen to the 2018 squad after losing four letterwinners, including a member of the Owls’ winningest duo in 2017 — Megan Rice. The most prominent newcomers to the team are freshman Johannah Cummines and junior transfer Amanda Silva. Florida State is undefeated against the Gamecocks, with the 10-0 record standing as the best record FSU holds against any team. South Carolina enters its fifth season under head coach Moritz Moritz. Last season, the Gamecocks earned a program-record 23 wins and made its first appearance at the NCAA Tournament. 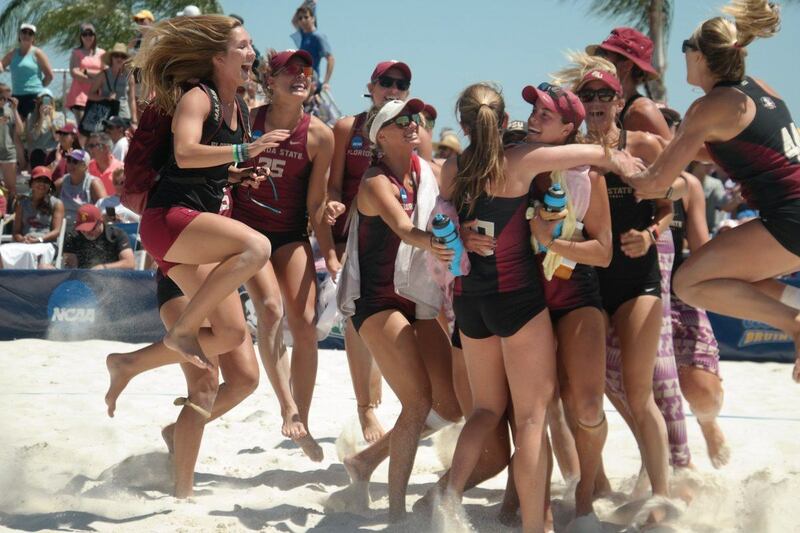 The Seminoles knocked the Gamecocks out of both the CCSA Tournament and the NCAA Championship in 2017. Moritz brought on nine new members for the 2018 season, including five freshmen and three graduate transfers — Clemson’s Leah Perri, Duke’s Cadie Bates and Creighton’s All-American setter Lydia Dimke. The Gamecocks return 13 letterwinners in 2018. Florida State holds a 5-1 all-time record over the Panthers. o FSU’s loss to Georgia State in 2015 is the only loss the Seminoles have to any team in the 2018 Stetson Spring Fling. Georgia State enters the 2018 season after coming off of its second consecutive twenty-win season, going 21-14 overall and 6-5 in conference play in 2017. The Panthers enter their fifth year under head coach Beth Van Fleet this season. Georgia State’s incoming freshman class includes an AVCA Beach High School All-American Honorable Mention (Hawes) and a U18 ROX National Champion (Bauchert). Van Fleet brought on eight newcomers to the 2018 squad (five freshmen and three graduates). Florida State holds an 8-0 all-time record over Stetson. Stetson enters its fifth year with head coach Kristina Hernandez. The team earned its third ASUN Beach Volleyball Championship in four years in 2017 after going 10-0 in conference play. Stetson received an at-large berth to the NCAA Championship in 2016, but did not go to the tournament in 2017. The team graduated three seniors in 2017, including Tiffany Creamer, who transferred to Georgia State for the 2018 season. The Hatters have no seniors on their 2018 squad, but brought on two transfers with the addition of Sammee Thomas from Long Beach State and Katinka Krahn from the University of British Columbia Okanagan’s indoor program.